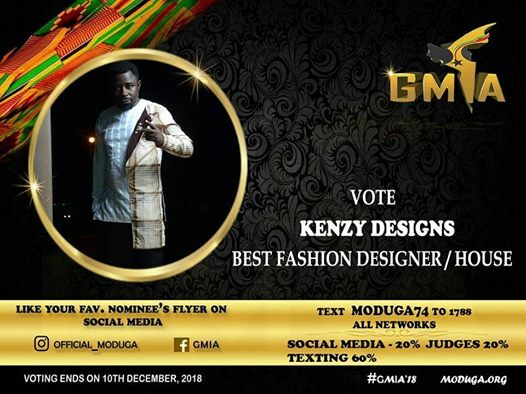 After clinching a nomination in the maiden edition of the Ghana Modeling Industry Awards (GMIA), the Chief Executive Officer (CEO) of Kenzy Designs Limited is doing anything possible to win from his nominated category. Kenzy De-Designer, known in private life as Saeed Alhassan Tariq, is in a fierce battle with Elikem The Tailor, Osasio Fashion, Nasana Fashion, Nichole GH, Delvis Fashion House, Quophi Akotuah GH and others in the GMIA Fashion Designer/House of the Year category. Following the unveiling of nominees, Kenzy has been canvassing for votes on all his social media handles. "We are making history. Voting on social media is once. Like my picture for me to win the best fashion designer in Ghana. Better still text moduga74 to 1788, all network," the Sunyani-based fashion designer wrote on his Facebook page. The 2018 edition of the Ghana Modeling Industry Awards is scheduled to take place at the National Theatre in Accra, on December 15. #Ghana #GMIA #gmia18 #awards #Africa."